Advanced nutrients CarboLoad contains only 100% organic carbohydrates, which makes it superior for two reasons. 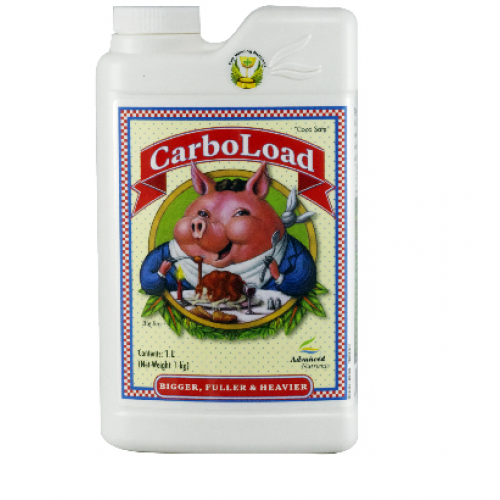 One, if you’re growing all organic plants and want to make sure you don’t spoil your crops with synthetics, you can use CarboLoad with no problems. And two, studies with the types of plants we grow, and in the types of gardens we grow them in show that organic carbohydrates are more readily absorbed, processed and used efficiently by plants like ours during growth and bloom phases. CarboLoad has a specifically designed blend of complex and simple carbohydrates so that your plants get the fast energy they need to kickstart growth… and… the lasting, complex fuel sources they need to keep growing and finish strong. The sugars in CarboLoad translate directly to floral sugars. This is because the sugars in CarboLoad fuels your plants internal pathways so your finished crops are more aromatic and taste sweeter than ever.